As The Real Deal has reported, the firm sued the upstart brokerage Compass for “brazenly” stealing roughly 60 agents and managers. In turn, Compass claimed that Corcoran was harassing and intimidating former agents. Judge Saliann Scarpulla, of the New York State Supreme Court, isn’t the only one hearing a case involving two New York City residential brokerages. It’s one of several lawsuits wending its way through the New York State court system. 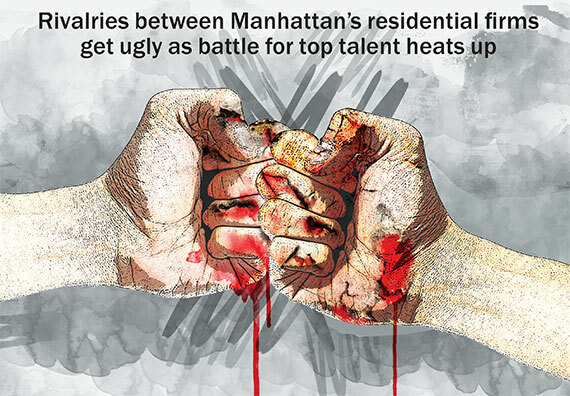 Amid unprecedented competition in the residential real estate world, the battling between firms has reached epic proportions as firms attempt to beat each other out for top talent. While the residential brokerage world has always been dotted with friendly rivalries, these new cases are anything but good-natured. In many instances they’ve turned into bitter and unrelenting feuds in which spurned firms are seeking recourse in the form of restraining orders and punitive damages. Sources say that this new wave of litigation is being driven by the rush of capital backing relatively new brokerages, which has created a heightened sense of free agency among brokers. Increasingly, as they look to minimize the damage incurred when an agent or executive leaves, companies — including Town Residential, Citi Habitats and Corcoran — are testing whether non-compete agreements are truly enforceable. “I’m fine with the competition for 1099s,” said Town CEO Andrew Heiberger, referring to agents’ independent contractor status. But he said the blatant and frequent poaching of salaried employees and executives has “gone too far.” He said he’s working to institute ethical recruitment standards in the industry, though he declined to discuss specifics. Eric Barron, CEO of Keller Williams NYC, which recruited nearly 200 new agents over the past 12 months, said the “highly competitive” environment is behind many of these broker moves. Persistently low inventory, he said, has put pressure on firms to hire top-producing agents. Some industry veterans echoed the idea that the influx of cash backing newer companies has upped the ante. For example, tech-focused start-up Compass has raised north of $70 million in venture funding from a largely untapped investor pool, while William Raveis NYC has the backing of a parent company that sold $8 billion in real estate last year. And Town, which launched in 2010, is backed by equity partner Joseph Sitt of Thor Equities. “All of them are investing in trying to get their New York City brand going, and that means that they’re willing to offer agents big stuff,” said Warburg Realty President Fred Peters. According to Oved, a firm that pays a signing bonus to a top producer may put “golden handcuffs” on the agent by requiring them to stay with the company for a certain amount of time or pay back the bonus. Compass, in particular, isn’t just wining and dining the agents it’s trying to recruit. The two-year-old firm, which has a valuation of $360 million, has offered equity stakes to lure top brokers to the start-up. Compass offered Leonard Steinberg, now company president, a reported $2 million salary and, sources said, a $2 million signing bonus when he left Douglas Elliman in 2014. More recently, in the case of Corcoran’s former Soho sales manager, Gene Martinez, Compass offered an array of bonuses and stock options. Compass CEO Robert Reffkin declined to comment for this story. But in a recent interview with TRD, he defended the company’s hiring of agents from other firms and insisted that it was beneficial for the industry. With so many new firms on the residential scene, and so much at stake financially, no firm has been immune to losing agents. Elliman, for example, lost Steinberg to Compass, but then gained Lauren Muss from Corcoran. Meanwhile, Corcoran snagged Cathy Franklin from Brown Harris Stevens, but then Brown Harris lost Kyle Blackmon to Compass and subsequently hired 10 agents from Warburg. Warburg later lost its star agent Richard Steinberg to Elliman. The rampant poaching, which industry veterans say is at an all-time high, has hardened firms against each other, prompting some to take the gloves off. Hall Willkie, president of Brown Harris Stevens, for example, didn’t hold back in November when Blackmon resigned. Rather than the standard milquetoast public statement wishing Blackmon luck and praising his work at the firm, Willkie took a jab at his former agent, whose 2012 sale of an $88 million penthouse at 15 Central Park West shattered records and made headlines for the firm. “Kyle has made the decision that the equity proposition offered to him trumps a singular focus on brokerage,” Willkie said in a statement at the time. There’s also no love lost these days between Town and Elliman, which hired Town’s former new development head Reid Price in 2013 and its former marketing executive Nicole Oge in 2014. Town sued both Price and Oge, alleging they breached non-competes with the firm. William Raveis launched a New York City office last year, headed by industry veterans Kathy Braddock and Paul Purcell, a former Elliman president. According to Raveis, Elliman began blocking emails after his firm hired a dozen agents from Elliman in Westchester. Sources at Elliman, meanwhile, speculated that Raveis emails were landing in spam folders after the brokerage sent a mass email to New York City agents in an attempt to poach them. Raveis acknowledged that it sent a mass email, but said it was simply market information that was widely distributed. The Corcoran-Compass face-off — which involves the defection of former Corcoran sales manager Patrick Brennan, the longtime sales team led by Debra LaChance and top agent Lindsay Barton Barrett — is, however, the ugliest. After Corcoran filed a lawsuit alleging that Compass “brazenly” poached agents, Compass accused Corcoran of embarking on a smear campaign against former agents and managers in an attempt to retaliate and scare off others considering a move to Compass. If so, Oved said that’s a strategy unto itself. “At the end of the day, you have to try to prevent poaching or people will continue to see you as a target,” he said. “Whether you win or not, you need to put up a defense and let people know you’re going to defend yourself,” said Oved, adding that some firms go to court simply to create a headache for their opponent. “Even if there’s no legal leg to stand on, they know the competition doesn’t want to go to court,” he added. The stakes are definitely getting loftier in an already high-stakes game. Leonard Steinberg, for example, closed sales and signed contracts for over $500 million in 2013, the year before he and business partner Hervé Senequier jumped ship to Compass after 13 years at Elliman. Early on, the duo brought $200 million in listings to Compass. Meanwhile, Blackmon was Brown Harris Stevens’ No. 1 broker in 2012. As of May 2014, he had $135.8 million in listings, according to TRD’s most recent agent ranking. Beyond the dollar volume of their listings, many top brokers are brands unto themselves and take teams with them when they move. And sources say that in Steinberg’s case, his move emboldened other agents to follow. Warburg’s Jay Glazer and Town’s Tinnie Chan Sassano joined Compass weeks after Steinberg shocked the industry with the announcement that he would join the upstart. Of course, the departure of top agents and managers also threatens to expose firms’ hard-won proprietary information and trade secrets. In August, Citi Habitats filed a lawsuit that accused Compass of hacking into its proprietary listings database and using the data to recruit agents and build its business. In a similar vein, Corcoran argued in its lawsuit against Compass that Martinez was privy to confidential information, including “unannounced products or services, sales data, client lists, agent splits, agent production, confidential client information, nonpublic financial information, and significant projects.” On those grounds, Corcoran asked the court for a restraining order to prevent Martinez from working for Compass. While the judge granted a restraining order preventing former Corcoran agents from accessing Corcoran’s listings database, she said there wasn’t a “chance in hell” that she would issue a restraining order for Martinez. Ironically enough, as firms face these headwinds, some CEOs of the city’s largest brokerages are now quietly joining forces to discuss what to do about the rampant raiding of each other’s companies. “It doesn’t look good when there are this many lawsuits,” said one brokerage head, who noted that litigation can be uncomfortable when firms co-broker deals. To that end, some firms have instituted more restrictive non-compete agreements. “Brokerages are pushing the envelope in terms of how broad and burdensome the restrictions can be,” said attorney Mauro Viskovic, who has worked with firms to craft longer agreements, or agreements that are broader in reach. Of course, not everyone agrees that the best strategy is to enforce non-competes.